The rally from December 26, 2018 low in S&P 500 (SPX) remains in progress. We are labeling this rally as animpulse Elliott Wave structure, which is 5 waves structure. In the chart below, we can see wave (3) ended at 2816.88 and wave (4) ended at 2722.27. The internal of wave (4) unfolded as a zigzag Elliott Wave structure. Wave A of (4) ended at 2767.66, wave B of (4) ended at 2796.44, and wave C of (4) ended at 2722.27. Wave (4) pullback ended at our blue box inflection area where wave C = wave A. This blue box area is a high frequency area where both buyers and sellers agree in direction of the next move for 3 waves at least. Anyone who bought the dips at the blue box should now have a risk free trade where stop is at break even level. The Index is currently in the last wave (5) rally which subdivides in 5 waves of lesser degree. Up from 2722.27, wave 1 ended at 2852.42 and wave 2 ended at 2811.37. Near term, while pullback stays above 2811.37, and more importantly above 2722.27, expect the Index to extend higher. Shorter cycle trend and momentum still points higher and we expect Index to find support in the dips in 3, 7, or 11 swing. Elliottwave-Forecast.com (by EME PROCESSING AND CONSULTING LLC) was founded in 2005 by Eric Morera. Since inception our company has provided tailored Financial Market Services to thousands of clients. 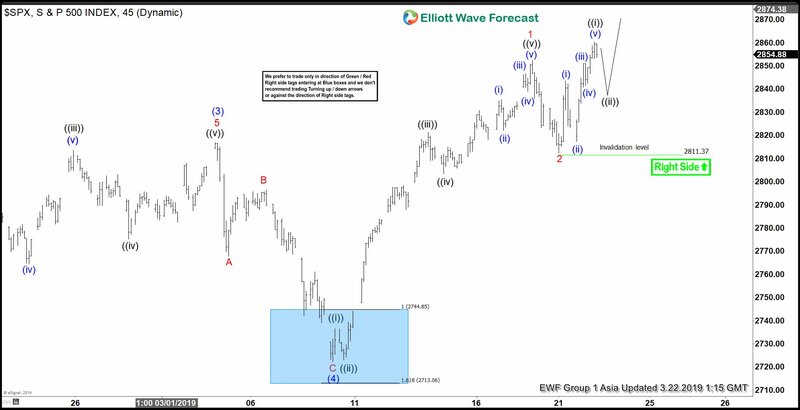 ElliottWave-Forecast has built a reputation on accurate technical analysis and a winning attitude. By successfully incorporating the Elliott Wave Theory with Market Correlation, cycles, proprietary pivot system, we provide precise forecasts with up-to-date analysis for 42 instruments including FX majors, Gold, Silver, Copper, Oil, TNX and major Equity Indices. Our clients also have immediate access to our proprietary actionable trade setups, market overview, 1 Hour, 4 Hour, Daily & weekly wave counts. Weekend webinar, Live Screen Sharing Sessions, Daily Technical Videos, Educational Resources, and 24 Hour chat room where they are provided live updates and given answers to their questions.